Here’s Gilbert Lesser’s classic poster for the infamous 1981 Broadway production of Frankenstein, a show that opened and closed on the same day. Written by Victor Gialanella, this adaptation first played to good reviews at the Repertory Theatre of St.Louis, in March and April of 1979. Translating to Broadway, the play acquired an extravagant budget and massive, state of the art sets, including a towering fuse-blower lab for the creation scene. The usual number of stagehands was tripled to 35 just to handle the set pieces rotating into view on a giant turntable or swinging in from the rafters. The show’s opening, set for December 1980, was bumped twice, first to allow fine-tuning of the complex special effects, and again when lead actor William Converse-Roberts, as Victor Frankenstein, was replaced by David Dukes. Other cast members included Dianne Wiest as Elizabeth and Keith Jochim, brought over from the St.Louis version, as The Creature. In an inspired bit of casting, the formidable John Carradine appeared as the Blind Hermit. 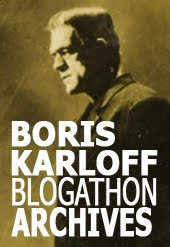 Forty-five years earlier, he had played a bit part as a hunter who stumbled into the Blind Hermit’s cabin and beheld Karloff’s Monster in Bride of Frankenstein. Problems multiplied and costs soared through rehearsals and over a run of 29 previews. When it finally premiered at The Palace on Sunday, January 4, 1981, the unanimously dire reviews dealt this Frankenstein the final blow. Frankenstein was shuttered by dawn. Over the next 48 hours, desperate attempts were made to save the show. Cast members volunteered for pay cuts and creators waived their royalties. One plan called for investors to pony up an additional $400,000 for retooling and television commercials, but at two million and counting — four times the initial budget — Frankenstein was already the costliest of all Broadway failures, earning a permanent spot on top ten flop lists. On Wednesday, January 7, the show was officially cancelled. Gilbert Lesser’s poster fared better. No sooner was it printed that it was snapped up by the Museum of Modern Art. "The show's folding notice wasn't even up yet,” Lesser recalled, “when the museum called to tell me the poster had been chosen for its permanent collection. It's the highest of honors." Lesser (1935-19990) was a pure designer, working with geometrical shapes and typography to achieve rigorously sparse and stunning images. 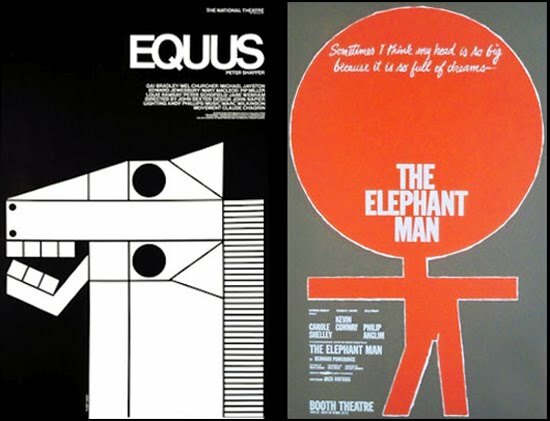 His theatrical contributions included a now famous poster for Equus using flat shapes like puzzle pieces for an image evoking Picasso’s Guernica. Lesser’s poster for The Elephant Man used the pictogram for ‘man’, skewing its limbs and replacing the dot on top with a large circle, suggesting the character’s misshapen head. 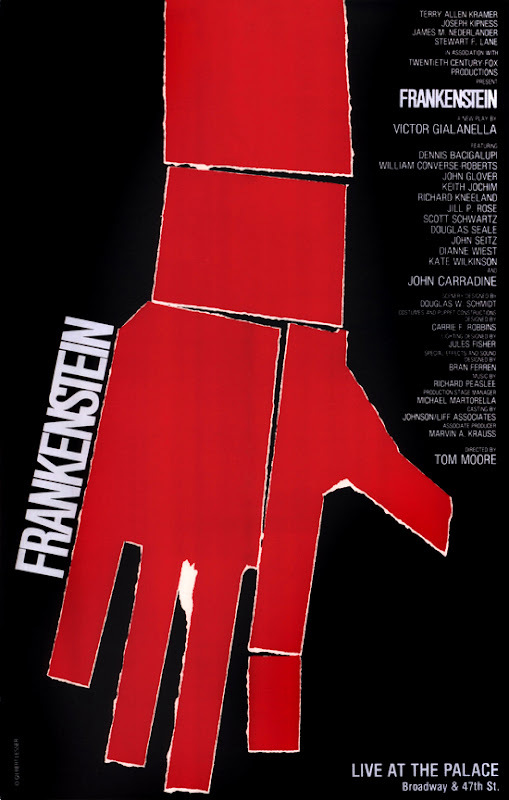 For Frankenstein, Lesser took the original St.Louis poster — a monster’s white hand against a black background — to another level, using torn paper to assemble the jigsaw hand. 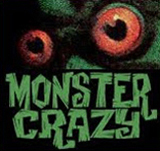 Lesser was of a school of stark design with Saul Bass, and his Frankenstein poster recalls Bass’ posters and title sequences for Anatomy of a Murder (1959) and Bunny Lake is Missing (1965). 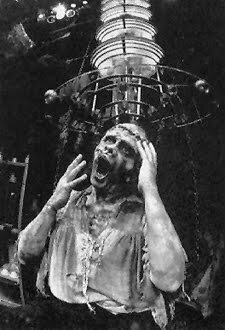 Victor Gialanella’s Frankenstein, in its original, pre-Broadway version, continues to be staged to this day. To be fair, the infamous Broadway version had been heavily rewritten. The author would go on to a brilliant career in television, earning two Daytime Emmy Awards for his work on Guiding Light and Days of Our Lives. An appreciation of Gilbert Lesser, from The Baltimore Sun. Frank Rich’s New York Times Review of Frankenstein (1981). How Broadway’s Frankenstein “nearly came back to life”. Missing that one-night performance is one of my great regrets. I did speak with someone who had seen it that very night, and thought it had gotten a bum rap, that the reviews were overly tough. "It wasn't great," she told me, "but it wasn't THAT bad." Oh, well. For whatever it's worth, I was later part of an even more expensive Broadway flop, helping to bump FRANKENSTEIN down the list a bit. Thanks for a great reminder of a sad and expensive failure. I remember reading a passing reference to this production when I was a kid, and I've always wanted to learn more about it. Love Lesser's poster art. I wish more photographs of this production were available. This B'way edition was one where the sizzle obscured the steak. I did not see it, but my good friend, genre historian Chris Steinbrunner, was there that magical (or infamous) night. He said the Carradine was chewing the scenery in a memorable way, and that the show was actually rather good. I am sorry to this day that I did not see it myself. Best of all We won the tickets to see it via WNEW FM ! I saw it as a fourteen yearear old theater brat and thought it was frickin' AWESOME. When the critics panned it and it flopped, I wondered how these old folks lost their sense of wonder and awe. A great show cut down by cynics.